Every leader wants the simple answer to this question – what does it take to be a High Performing Team? And once you reach HPT status, how do you stay there? We have explored the concept of ‘high performance in teams’ on many occasions in our blogs. We have also published a ‘tips and hints’ guide to help provide ideas to help you strengthen the fundamentals of your team. This blog link shares some recent research about the recipe for ‘high performance’ and highlights just how importance communication is in the most effective teams – and shows why ‘the way people communicate is by far the most important factor’. 5. Members periodically break, go exploring outside the team and bring information back. ‘They concluded that the best way to build a great team was not to select members based on how smart they were but on how well they demonstrated the above characteristics or how quickly they learned how to use them. The modern 21st century Team Leader or Manager needs to know how to shape and guide the team so that it follows successful communication patterns. So what can a leader do to improve team performance? The researchers discovered that there are 3 key elements of communication that have a profound affect on team performance. 1. Energy: the number and nature of exchanges between members. Find ways for more face-to-face interaction, or at the very least phone or video conversations. 2. Engagement: This element reflects the distribution of energy amongst the team members. Find ways to keep people motivated, involved and satisfied at work. 3. Exploration: This involves communication that team members engage in with others outside the team. Find ways for team members to connect and network – to gain new insights and perspectives that they can take back to the team. The study also found that the best team players connect their team mates with others and spread ideas around. How about in my team – how well are we doing? So ask yourself: How effectively are you communicating with your team? And how effectively are you role modelling and encouraging the patterns mentioned above? Click here to access the full HR blog by David Klaasen. Anything else to consider for ways to improve our performance? Start by asking the questions above about communication. And find ways to embrace the energy, engagement and exploration concepts above. 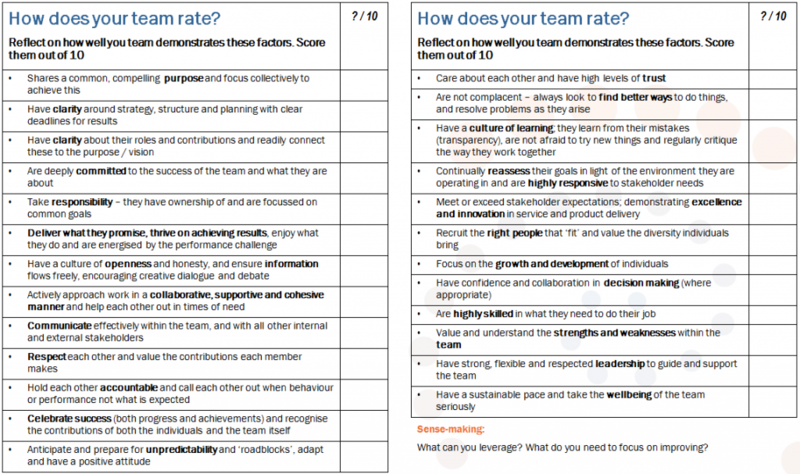 If you also want to look deeper, think about finding 5 minutes to stop and reflect on your team by using this simple teams assessment. Reflect on what you see. What ‘good’ things can you leverage? And what do you need to focus some energy on improving? And ask all team members to do the same. Unsurprisingly, spending time working on and discussing the fundamentals of team performance – with the team – is an essential practice that helps bring about the ultimate goal of team excellence.